Although I did plant some green beans in our garden, I have to admit that these were not from mine, but from my fave warehouse store, Costco. These are French beans or haricot verts according to the packaging. I bought a pack a few weeks ago before our plants started bearing fruit. Heat/melt butter, add garlic and saute’ until fragrant. Add beans and roll in the butter & garlic mixture for about a minute. Add the water and sprinkle with salt. Cover and let cook until water evaporates. Take the pan off the heat as soon as it starts to dry up. Place on a serving dish and sprinkle with pinenuts. I like to eat green beans. Surely, in the coming days, I can follow your recipe. MMM. I’ve been eyeing those beans at Costco for a while now. Thanks for the complement for my kiddies. 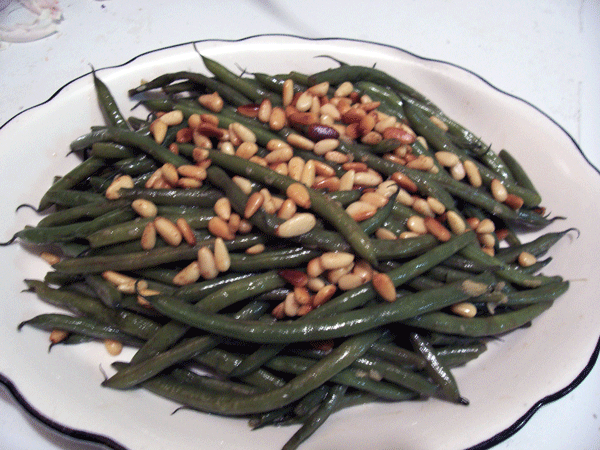 I do love PINEnuts, but never tried them in green beans. When I was young, we used to spend hours trying to crack the california pine nuts open. Never thought they would be available commercially. Though I know it is a different variety. I also want to complement you on your blog (colors, layout, etc) as it is very pleasing. It portrays a wholesum-ness that a food blog should have. Well done. Hmmmm I havent tried that yet. I like greenbeans but is it more delicious with peanuts? Since it does look delicious! Looks yummy and this must be healthy stuff!